Heat 5-quart Dutch oven over medium heat. Add bacon; cook 8 to 10 minutes or until just crisp. Using slotted spoon, transfer to paper towel-lined plate; set aside. Reserve drippings in Dutch oven. Toss beef with 2 tablespoons of the flour; season with salt and pepper. Increase heat to medium-high. Working in two batches, brown beef cubes in drippings 2 to 3 minutes, turning to brown on all sides. Reserve on plate with bacon. Repeat with remaining beef cubes. Add carrots and onion to Dutch oven; cook 6 to 8 minutes, stirring occasionally, until onions are softened. Stir in mushrooms and garlic; cook about 1 minute or until garlic is fragrant. Add tomato paste; stir to coat vegetables. Add wine, broth, thyme sprigs, beef and bacon. Heat to simmering. 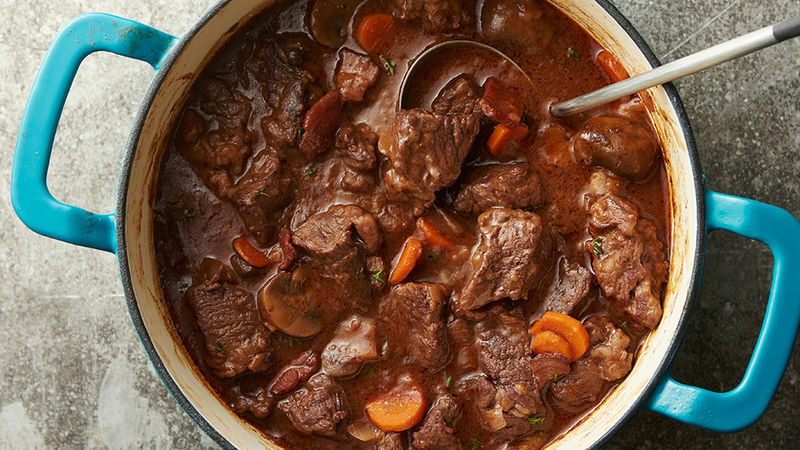 Reduce heat to medium-low; cover and cook 55 to 60 minutes or until beef and carrots are tender. Remove thyme sprigs. In small bowl, mix remaining 3 tablespoons flour and softened butter; mash with fork to form a paste. Beat butter mixture into wine mixture in Dutch oven with whisk. Simmer about 3 minutes, beating continuously, until paste is completely dissolved and broth has thickened. Save the remaining tomato paste by scooping it in 1-tablespoon amounts on parchment paper-lined cookie sheet, and freezing. Once frozen, toss them in a resealable food-storage plastic bag in the freezer, and use within 6 months. Serve with mashed potatoes, buttered noodles or rice.